In terms of the film's Oscar prospects, I would currently say its best bets are Best Picture, Best Actress and Best Supporting Actor. 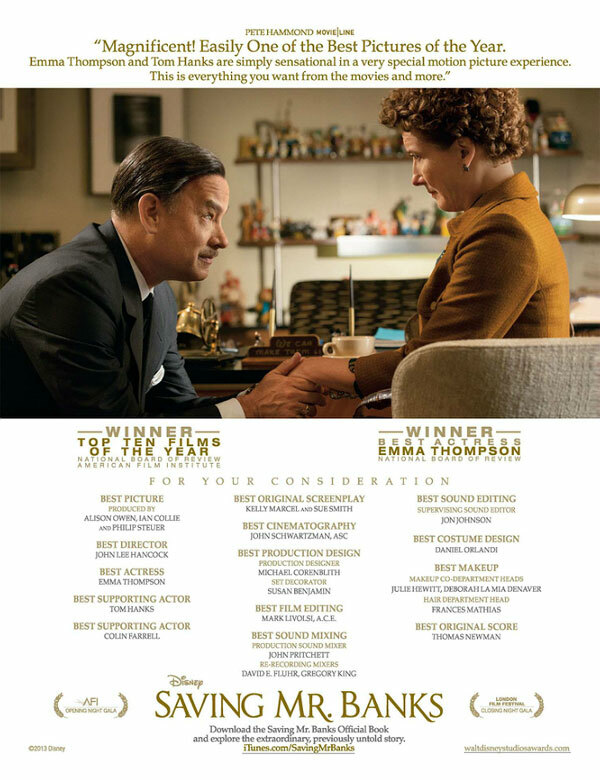 Emma Thompson is already an AMPAS favourite and Tom Hanks certainly has his "Oscar clip". Also, the film is the type of light drama with just enough gravitas that would appeal to Academy voters. A month ago I would also have put this in contention in various other "technical" categories but at this point, these 3 nods seem the most likely. The film is definitely a wildcard in the Oscar race though, so it would be interesting to see how it fares come nominations time. Saving Mr. Banks is a confection and should be viewed as such. In that regard, it works admirably, which is all you can reasonably ask.